Life is a highway. And they definitely road it. It’s the 30’s and Bonnie and Clyde are running wild in the country. They’re robbing, killing, and getting all of the attention of the world on them, solely for being criminals. Obviously, those involved with law-enforcement aren’t too happy about this, so they decide that enough is enough and it’s time call in the big guns. 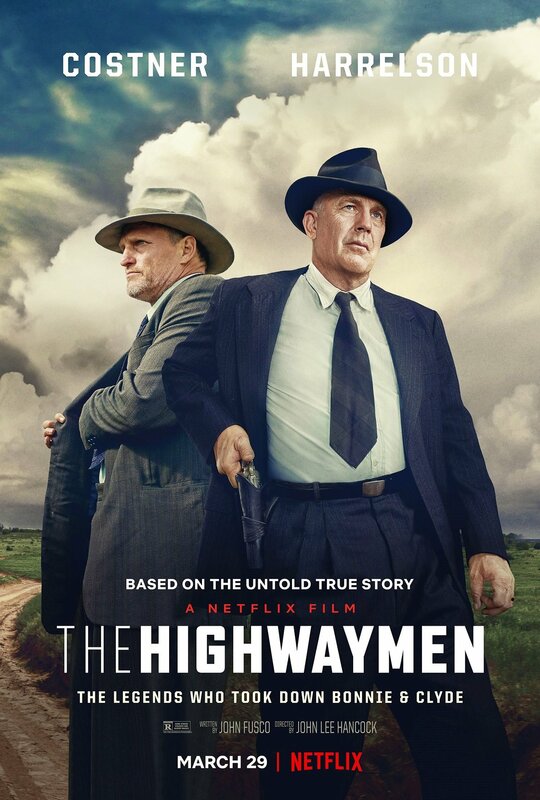 Enter Texas Ranger Frank Hamer (Kevin Costner) and ex-partner Maney Gault (Woody Harrelson), two men who have been through the thick and thin and will not stop until they find Bonnie and Clyde, and finally bring about justice. But it’s been quite some time since either of these two were acting as enforcers of the law, especially as ones with such intentions of killing, and after awhile, this all begins to take its toll on each other, making them wonder: Just what the hell do they do with Bonnie and Clyde once they find them? It’s weird to get a movie about Bonnie and Clyde that’s, you know, not about Bonnie and Clyde and the Highwaymen sort of proves as to why that is the case. And it’s odd because if you look at the real lives of both Hamer and Gault, they’ve got a lot to make you interested in their stories, their lives, and just where they saw their careers as cops. But the Highwaymen is also the kind of movie that doesn’t really dig deep into this kind of stuff, and just rely solely on the pure charm of both Harrelson and Costner. And well, it sort of works. So really, can you blame the movie? Yes, you still can, but you also can’t hate it either, which is where I find myself a tad conflicted. The Highwaymen is a rather slow, middling movie that doesn’t have a whole lot of interesting stuff to say, do, or really bring to our eyes and ears, but it’s enjoyable enough to keep you watching, Costner and Harrelson seem to be enjoying one another’s company, and the tone is surprisingly old-school, that it feels like the perfect movie to watch with your dad, or hell, a senior-citizen. It’s the kind of movie that’s perfect viewing for a Sunday afternoon, but because it’s revolving around Bonnie and Clyde and starring both Costner and Harrelson, it somehow has to be perfection. When in reality, it doesn’t. Director John Lee Hancock has an interesting track-record where he takes an already interesting biopic subject and give them an even more interesting spin (Saving Mr. Banks, the Founder), or just play it simply middle-of-the-line and down the road, almost to the point of where it’s a little dull (the Rookie, the Blind Side). With the Highwaymen, you can tell that he’s stuck somewhere in the middle, but mostly leaning towards the middle-of-the-road stuff, as it’s almost like even he doesn’t know where to go with these guys’ stories and why the hell they should matter to us to hear about. Come on, Kathy! Chew somebody out! For instance, Hancock and writer John Fusco sometimes come close to exploring the notion of “old school handling of the law vs. the new school”, but considering that this is the 30’s, times are tough, and yeah, there’s still a whole lot of social injustices going on, the point doesn’t really get knocked home. Same goes for the understanding of why these crimes are happening and what kind of a toll it’s taking on these two cops; they seem hesitant to go outright shoot Bonnie and Clyde because they’re human after all, but they also don’t want to be perceived as “wimps”. There’s also this odd notion about yellow journalism and how it’s practically fed into the Bonnie and Clyde machine despite, well, them being cold-blooded criminals and all. But even that, once again, doesn’t really seem to be talked about much, or at all. So really, it’s just a film without much to say. All it really has to do is give us Woody Harrelson and Kevin Costner, acting, having fun, and getting paid to do so. And hey, what’s so wrong about watching people get paid, eh? Consensus: Without really digging too deep into its subject matter, the Highwaymen holds itself back from being another more than just a simple, standard, and relatively enjoyable yarn, with two great actors doing their darndest to make it all go down smoothly. Hmm, sounds good. I’ll probably be watching this tonight then. Thanks for the reminder this is out.